The image above tends to stick in my head. I’ve used it before, because it is so striking. The windowpane charcoal peak lapel suit is just as appropriate today as are the slightly squared, chisel toe black oxfords. It is, of course, the other details that betray its 1930’s origin. I will probably wear my white kid gloves today. It’s cold. I would prefer a white collar shirt. Alas, mine went the way of the dodo. But this brings up another point. You can wear coloured shirts. On the whole, it is best to choose a lighter shade over a stronger one. Pale blue, pink, yellow, grey, even green can work well. If in doubt, the white collar (don’t forget double cuffs) will up the formality, but frame your face in a familiar light. 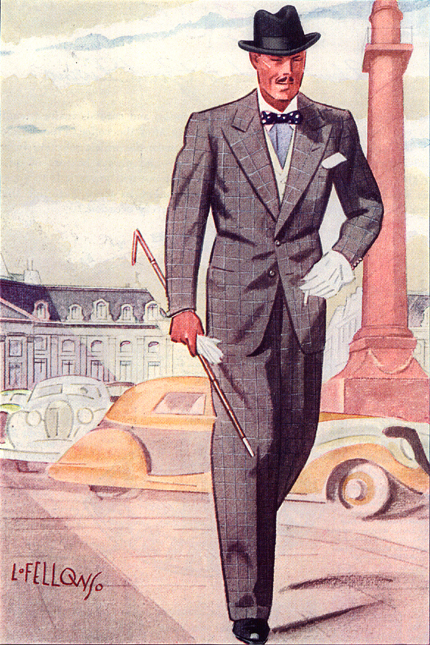 This entry was posted in Elegantology and tagged 1930's, Apparel Arts, Fellowes Illustrations, Men's Clothing, Tailored Suits. Bookmark the permalink. EE – I like the white vest a great deal, where did you find yours? Does it have a full back or is it “backless”? I don’t recall seeing one that wasn’t intended to be worn with evening clothes. My absolute favorite Apparel Arts photo. If it wasn’t for the fact that I need about nine more basic-type suits (blues, charcoals, chalkstripes), I would get that one. Hello Athenaeus, It’s a Corneliani, purchased at a men’s store on the Champs-Élysée about a decade ago. It is cream linen with a full back. Turling, I’m with you. The suit that I’m wearing was purchased through eBay! It is a flannel Luciano Barbera Sartoriale collection and is fantastically comfortable. That said, I couldn’t do without my chalkstripe suits or the light greys for the warmer months. You’ve managed to pull off the look with aplomb. Applause all around. Is the vest in the illustration white? Compared to the gentleman’s collar, handkerchief, and gloves, I thought it was closer to buff. I very much agree with you and Turling, however, on how great these images are. Nostalgic and inspirational at the same time. Hello Andrew, on closer inspection (and having adjusted my monitor) you may be right. The vest does look buff coloured. I thought it a cream. Thank you SP. I may have gotten the bowtie fixation out of my system with this one. Although, I think this may be my Easter Promenade combination. I have had some good luck with e-bay. The sport coat I am wearing at the moment was purchased through e-bay, as well as the shoes I wore yesterday. As for suits, it always appears the inseams are at least two inches too short for me and I like a cuff, so I’m concerned I won’t be able to have them let out and still get a cuff on them. It does help to know your measurements, doesn’t it? Aside from having to shorten the collar a bit, the suit fits me very well. And the trousers were cuffed and had working buttonholes at the sleeves… I was terrified. Oh how did you know that window-panes, and tattersalls, pin-stripes -always remind me of spring. When I worked at Ralph – these patterns were classics. I also love them with cream or white wool. A Lord’s hat won’t do you much good I’m afraid. The shape is the same as the homburg’s only the brim is unbound and it has a couple of bashes in the crown. I agree that the Eden in Paris waistcoat is ivory, and ought ideally to be cashmere. Cashmere is well utilized in vests as they require only half a yard of the precious stuff. Mrs. PvE, isn’t it funny? 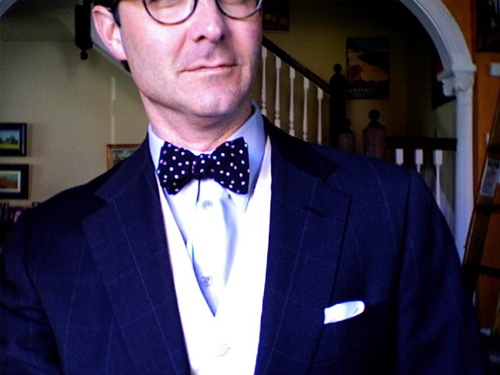 I associate tattersalls and windowpanes with winter and fall, pinstripes with spring. But I think the added burst of cream or white does put a little spring bounce in them. Ralph is good at the classics. I’m glad that he continues to reinforce them as such in the public mind. The illustration above reminds me of the great advertisements that used to appear in our local newspaper each week from all of the finer clothing stores. Before everything was computer-generated, they were drawn/sketched, and each store had its own distinct style, depending on the artist. My mother, an art major from Pittsburgh, had an early career in sketching ads for one of these stores right out of college. Fortunately, I have some old copies of those papers. They are, like your picture above, so sophisticated–hats, gloves, fine fabrics. It was all about the silhouette and details. It was all so much more interesting and original. I must say I miss it. Thanks for the great image and post. Hmmm, thanks Will. I wonder if having one made up wouldn’t solve the problem? I imagine that they can make allowances for pinheads like mine. Great advice about the waistcoat (as always.) An ivory cashmere would be the height of decadent dressing for me. You have motivated me to locate them and I will definitely forward. They would be darling framed for our son’s and daughter’s rooms, depicting great style for the gents and ladies. I remember looking forward to the papers to see the ads–The Tiffany ad in the WSJ used to be fabulous and the only one on page 3. I should venture that the gloves are, almost certainly, yellow chamois gloves and not white kid. Thank you Mr. Storey (I look forward to reading your interview on the LL), My Army brat background betrays me. I do have a pair of the chamois, too. Very comfortable. If unlined (like the kid.) Which would also lend credence to the idea that the waistcoat is buff coloured. I wonder, what are the rules for matching one’s gloves, hat, etc. to one’s shoes, overcoat or whatever? May I ask the source of the photo? It’s fantastic. I’m writing an essay on 1930s suits and would love to know where I can find that image in the AA archives. Hello Matt. It is from a book entitled “Men In Style”, now out of print. I believe the illustration was from Spring of 1935 or ’36.